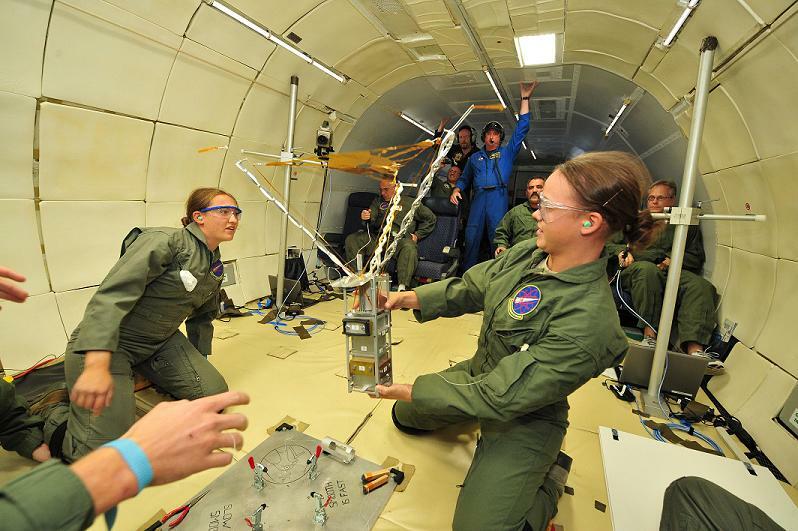 Air Force Academy cadets recently took a ride in NASA’s “vomit comet” to test a satellite they are designing. The FalconSAT program allows cadets to design, build, launch and operate their own small satellite, according to the Academy. 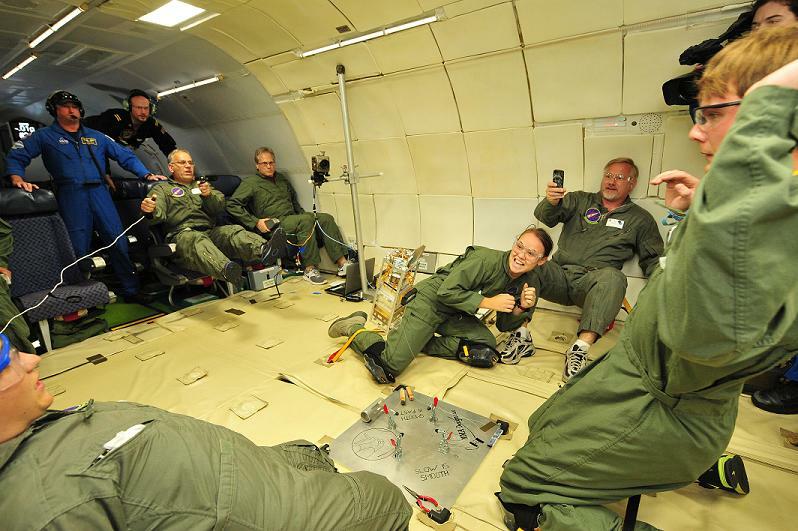 The vomit comet ride allowed cadets to see how the satellite performs in zero gravity. FalconSAT-7 is a little, itty bitty satellite: Only 30 centimeters by 10 centimeters by 10 centimeters. Slated to be launched in 2014, it will be the first telescope in space to use a stretched membrane with billions of holes in it instead of a glass lens for its optics. Left foreground: 2nd Lt. Samantha Latch, 80th Operations Support Squadron, Sheppard Air Force Base, Texas. Sam is a 2012 graduate of the Air Force Academy. As a senior cadet, she majored in physics and worked on FalconSAT-7. After the test, she will return to Sheppard AFB for pilot training. Right foreground: Cadet 1st Class Heather Nelson, Cadet Squadron 16, U.S. Air Force Academy, Colo. Heather is a senior, majoring in astronautical engineering, and currently working on FalconSAT-7. Both are testing a successful deployment of the FalconSAT-7 payload, the photon sieve NASA PHOTO. Center: Cadet 1st Class Heather Nelson, awaiting the rapid deployment of the FalconSAT-7 payload. In the foreground, the two people bending out of the shot are, left, 2nd Lt. Samantha Latch and right, Trey Quiller. Another proud parent! Congrats to Sam, Heather, Trey and Todd for a successful test! !